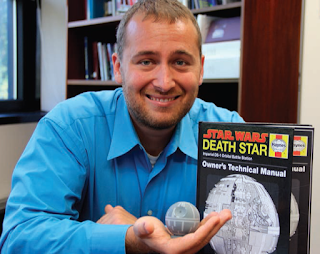 Dr. Matthew Lux holds the 3D printed Imperial Death Star. Dr. Matthew Lux, an informatics expert, started researching DNA’s storage capabilities. In 2013, Lux submitted a proposal to the Edgewood Chemical Biological Center (ECBC)’s In-house Laboratory Independent Research Program (ILIR). Now, the DNA CODE has risen from translated binary code and can now reside in bacteria, the last resource for information storage. With the support of SGI-DNA’s BioXp, Dr. Lux leads a brave new line of research to restore peace and accelerate discovery to the galaxy. The US Army’s ECBC has sent its most daring informatics expert on a not-so-secret mission, to explore the potential of microbial memory and encode plans for the imperial death star. It is a time of hope for gene synthesis. Download the ECBC Article Featuring Dr. Lux’s Research (pdf).